Yep. Another reread. Another situation where I read book 1 and then never read book 2. And, another book I never reviewed when I read it in June of last year. Frankly, as much as I love graphic novels... I hate reviewing them... Standalones are okay, but I find series impossible because I hate spoiling stuff. Apparently 2013 was just not the year of the graphic novel for me. I did really bad with keeping up on things. This year is about fixing that! 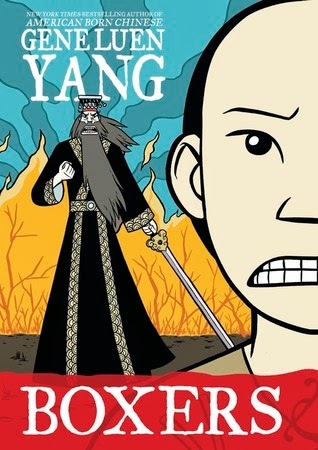 Gene Luen Yung has quickly become one of my favourite graphic novel authors. I originally read him in 2009 and have made a point to pay attention to his releases ever since. When I first heard of this duology I knew I was going to have to grab a copy. Little Bao is an interesting character. You get to see him grow throughout the book. He doesn't always make the right decisions, but he does what he thinks is in the best interest of China. It made for a very interesting story that I enjoyed just as much the second time as the first. I wish I had read this last year. 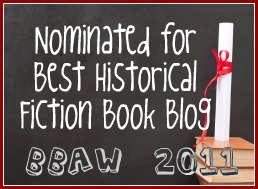 I really liked this book! What Yang essentially does with this story is go back to the beginning with a character that will appear a couple times in Boxers. We see her difficult up-bringing and how she winds up turning to Christianity. Her grandfather would not give her a name; so she grew up being called Four-Girl until she is baptised and can rename herself to Vibiana. This is her story and I really liked the female-viewpoint. There is a female character that prominently appears in Boxers, but the story is only told from Bao's point of view. 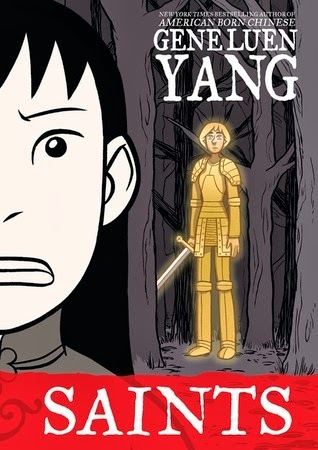 So, in just 170 pages Yang talks about gender issues, growing up a girl in China, Christianity, and the Boxer Rebellions. It is about half the size of Boxers but just as powerful. I felt really bad for Vibiana. Her goal in life was just to get her grandfather to love and accept her, but nothing she tries works out. This leads her on an entirely different path away from her family and up-bringing. It gives her a chance to be herself and break away. It is not always perfect, though. She really struggles with her identity and her decisions. But, it is worth reading. I would definitely read Boxers first, though. And don't be like me, read them both at the same time! They really flow well together and like all of Yang's work, they are worth checking out. Not to forget, but this book also ties in Joan of Arc!